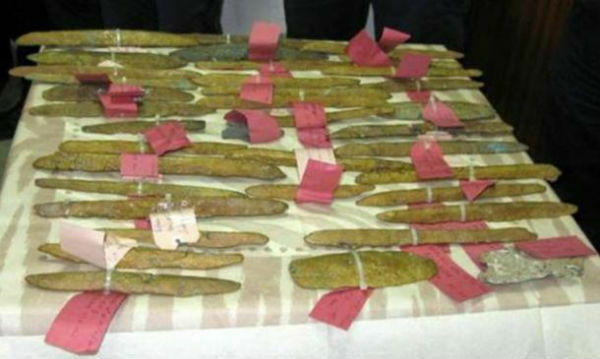 Rumored by Ancient Greeks to have been mined in Atlantis, Orichalcum, the Metal of the Gods has been recovered off the coast of Sicily, from a ship that sunk 2,600 years ago. Its composition and origin argued over, Orichalcum’s existence has long been thought a myth by scholars and historians alike. Orichalcum first appears in the 7th century BC in the Homeric hymn dedicated to Aphrodite, dated to the 630s attributed to Hesiod. According to Plato’s Critias, the three outer walls of the Temple to Poseidon and Cleito on Atlantis were clad respectively with brass, tin, and the third outer wall, which encompassed the whole citadel, “flashed with the red light of orichalcum”. The interior walls, pillars and floors of the temple were completely covered in orichalcum, and the roof was variegated with gold, silver, and orichalcum. In the center of the temple stood a pillar of orichalcum, on which the laws of Poseidon and records of the first son princes of Poseidon were inscribed. Orichalcum also appears in the writings of the Jews. In Antiquities of the Jews Josephus, wrote that the vessels in the Temple of Solomon were made of orichalcum. Pliny the Elder points out that the metal had lost currency due to the mines being exhausted. Pseudo-Aristotle in De mirabilibus auscultationibus describes orichalcum as a shining metal produced during the smelting of copper with the addition of “calmia” (zinc oxide). The cast metal which possibly came from Greece or Asia Minor was being delivered to Gela in southern Sicily when it sunk off its coast. The ship that was carrying them was likely caught in a storm just when it was about to enter the port. The 39 ingots recovered from the wreck were destined to be used in workshops in the making of high quality decorations. -Sebastiano Tusa, Sicily’s superintendent of the Sea Office. A total of 39 Orichalum ingots were recovered from the sea floor surrounding the wreckage, a truly rare and unique find. Considering researches only new of the metal through the study of ancient text and a few ornamental objects. Nothing similar has ever been found, in fact the metal’s very existence was long considered false. The mysterious metal was said to have been forged by Cadmus, according to the ancient Greeks, a largely mythical character of Greeko-Phoenician origin. It was not however until the fourth century B.C. Greek philosopher Plato cited it in the Critias dialogue that the legend of orichalcum was birthed into the world. Plato, in describing Atlantis as flashing “with the red light of orichalcum,” wrote that the metal, second only in value to gold, was mined in Atlantis and furnished Poseidon’s temple interior, walls, columns and floors. 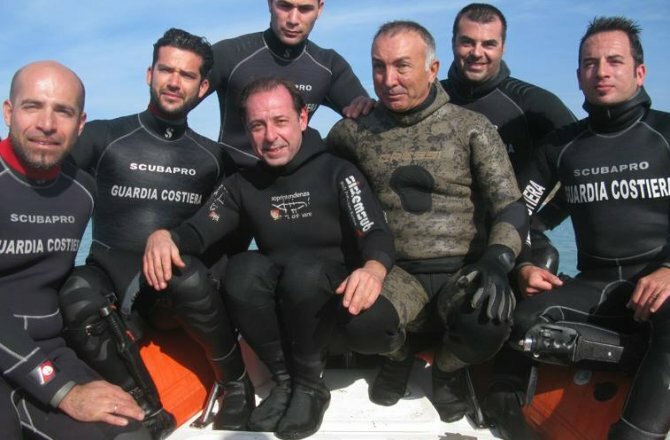 With the find off the Sicilian Coast, the metal’s authenticity of which there is little doubt. Today most scholars agree orichalcum is a brass-like alloy, which was made in antiquity by cementation in a crucible. Adding and aiding the process with the reaction of zinc ore, charcoal and copper metal. Through further investigation conducted with X-ray fluorescence,the composition of the material is now confirmed. The 39 ingots are an alloy made with 75-80 percent copper, 15-20 percent zinc and small percentages of nickel, lead and iron. “The finding confirms that about a century after its foundation in 689 B.C., Gela grew to become a wealthy city with artisan workshops specialized in the production of prized artifacts,” Tusa said. To add fire to the debate and shrouding the metal in even more mystery are the findings of Enrico Mattievich, a retired professor of physics who taught at the Federal University of Rio de Janeiro (UFRJ). According to Mattievich the ingots are not properly made from orichalcum. “It appears they are lumps of latone metal, an alloy of copper, zinc and lead,” Mattievich, who has led a number of studies in physics applied to mineralogy, paleontology and archaeology, is one of the scholars who disagree on orichalcum being a brass based metal. Further confusing the debate, while other scholars equated the mysterious metal to amber and to other copper based alloys, Mattievich believes orichalcum has its roots in the Peruvian Andes and in the Chavín civilization that developed there from 1200 B.C. to 200 B.C. 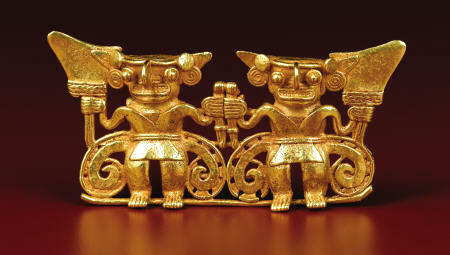 As chronicled in his book “Journey to the Mythological Inferno” Mattievic claims that the ancient Greeks had discovered America, and there, a metallic alloy “with fire-like reflections” similar to Plato’s description was found in a set of metallic jaguars of Chavin style, which were revealed to be made of 9 percent copper, 76 percent gold and 15 percent silver. Previous PostWhat Happened to Malaysian Airline MH17Next PostThe future of warfare is Here!